Light should be bright, with direct sunlight diffused so as not to burn the leaves. 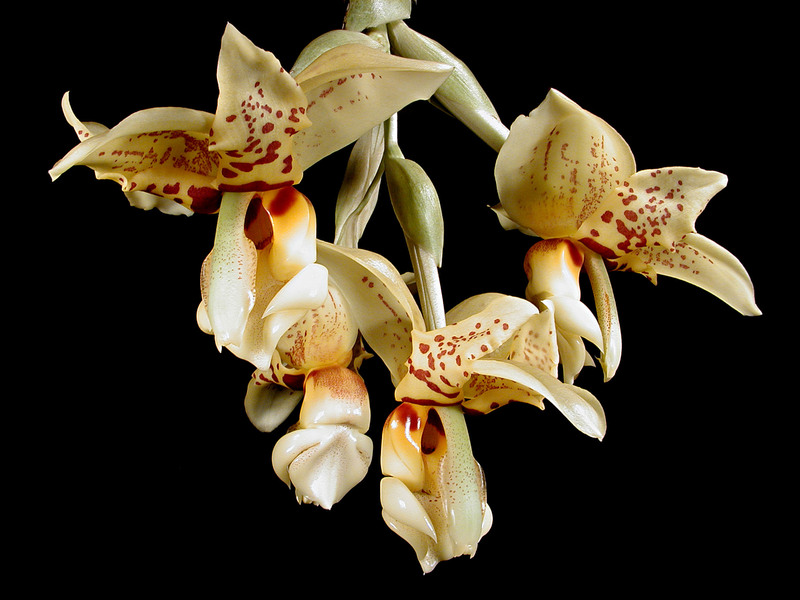 Most growers suspend these orchids due to their pendulous inflorescences. This also brings the plants closer to the light. Light levels approximating those for cattleyas, around 3,000 foot-candles, are best. Temperatures should be moderate: 52° to 60° F at night, with day temperatures 68° to 75° F in the winter. Plants can stand short spells of higher temperatures, but air movement, humidity and shading must all be increased. Many species flower in the summer, and putting them outside in the summer may be beneficial. Move into higher light slowly to avoid burn. Water in ample quantities is important to produce strong pseudobulbs and prevent foliar spotting. Stanhopeas and their relatives can be sensitive to salt accumulation in the medium, so should never be allowed to dry out entirely, even during the winter months when growth may slow or stop. Poor watering habits are also conducive to root loss in these types, and some may be very slow to re-establish once they have lost their roots. Fertilize at regular intervals. Most growers fertilize with a diluted concentration every week to two weeks. For plants in bark, use a 30-10-10 high-nitrogen formulation, alternating with a 20-20-20 balanced formulation; in the blooming season, which is mainly summer, use a 10-30-20 blossom-booster formulation. Plants grown in osmunda need fertilization only infrequently. Potting is done best right after summer flowering, as most plants seem to grow year round. Plants that rest in the winter can be repotted in the spring. The best flowerings come from large clumps of plants, so large baskets are usually used. An airy, yet moist medium seems to work best, such as medium-grade fir bark (often mixed with sphagnum peat) or osmunda fiber. Vigorous plants may need repotting every three years or so.